The sport of surfing has not existed in its current form for long time, but it’s fast becoming one of the most exciting and fast-paced televised sports in the world. Just about every event is now screened live into our living rooms, giving punters who want to gamble on a sport that is both unpredictably exciting and fast enough to be a good wagering sport, because you get the result quickly. For those unfamiliar with the sport, this article will take a look at surfing, the ways to beat on it and some of Australia’s best ever exports. The original governing body of professional surfing – the International Professional Surfers – was founded in 1976 a by Hawaiian surfers Fred Hemmings and Randy Rarick, and has since morphed into the the format that we know today. At the start of the 2015 season, the ASP changed its name to the World Surf League (WSL). The WSL organises the the annual tour of professional surf competitions around the world, which includes 11 events on the Men’s Championship Tour and 10 events on the Women’s Championship Tour. The World Surf League’s headquarters is in Los Angeles, California with offices throughout the globe. Surfing is one of the most entertaining and unpredictable sports in the world today, making it an absolute blast to bet on for those who love an upset and making cash. Head-to-head: Just like regular individual sports where athletes face each other in head-to-head events, surfing pits the rivals one-on-one or as a three way competition. Futures betting: Those wanting to bet on who will win an event itself, or the overall surfing title can do so by going to a futures market. You can also invest on who you think you will make the semi-finals, and also who you think will make it through to the final. Novelty: Australian bookies love throwing up random markets. An example of a novelty market might be whether Mick Fanning would make a comeback to the pro-surfing tour. Australia is a sun kissed nation that is famous for its beaches; which lends itself greatly to the professional surfing circuit. Some of the greatest ever surfers have come from the land down under so we thought it would be appropriate to run through some of the stars that have pioneered this sport in Australia. 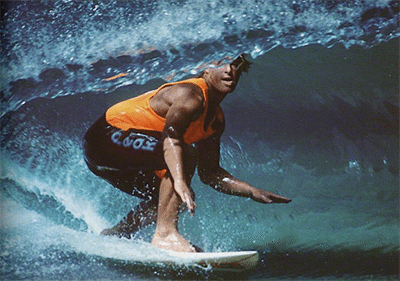 Mark Occhilupo is universally regarded as one of Australia’s best surfers. He is seen in action here in 1987. Mark Occhilupo: One of the most popular surfers of all-time, the man they call ‘Occy’ revolutionised the sport as a cocky teenager, but a battle with drugs and depression saw Occhilupo fail to reach the lofty heights he looked set to reach. After two years out of the sport Occy returned in 1999 to win his maiden surf title at the age of 33, cementing his legacy as one of the country’s finest ever. Mick Fanning: Despite being known as the man who took on a shark on the professional tour and lived to tell the tale, Mick Fanning is actually one of Australia’s most successful surfers. Fanning won the 2007, 2009 and 2013 ASP World titles – making him one of the most decorated athletes to ever take to the water. Layne Beachley: While others may lay claims to being the most popular surfers in Australian sporting history, few can rival the feats of Layne Beachley. The Manly product has won an incredible seven world championships – the most of any woman in world surifing history – and in 2004 Beachley competed in the men’s competition. Beachley’s impact on the sport has been so profound that she is now one of the four vice presidents of the International Surfing Association. Mark Richards: He may not be a household name, but Mark Richards has serious claims to be recognised as one of the true trailblazers of the sport that helped drag the sport out of the periphery and into the mainstream. Mark Richards dominated professional the sport from 1979 to 1982, winning four consecutive world titles. His professional attitude towards the sport and clean-cut good looks helped propel surfing to being accepted as a legitimate sport. Don’t assume the big names will get the win: It is always tempting to go after the big names in surf betting – like Kelly Slater – but the American is hardly the force he used to be. Keep an eye on the world rankings and make sure the allure of the big name does not cloud your judgement when it comes to betting on surfing. Live betting can be your best friend: Sometimes, due to the unpredictability of the ocean, big upsets can happen. If a listed surfer misses a quality wave, the unlikely option in the betting can get the score required to knock a big name out. As with all in-play bet types, underdog’s odds do not change too heavily until it looks like the upset is almost certainly going to happen – but in surfing a match up can be over with one wave. Get in early on the in-play betting and you could reap the benefits.